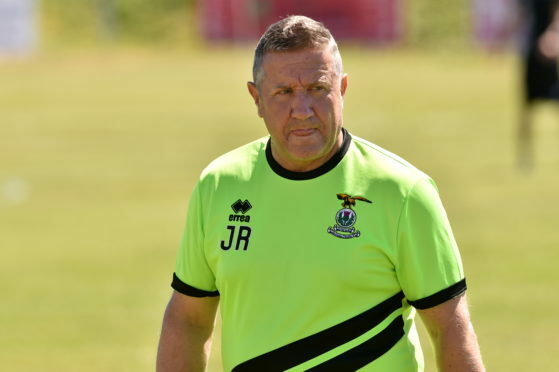 Caley Thistle manager John Robertson is spearheading a push to establish an official women’s team at the club. The profile of the women’s game has never been higher in Scotland following the national team’s historic first qualification for next summer’s World Cup finals in France. Robertson is a fully-fledged fan of female football and wants to see Caley Jags represented domestically. Caley Jags briefly had a women’s team from 2004 to 2006 with the side reaching the League Cup final in season 2004-05 where they lost 2-1 to Forfar Farmington after extra-time. He said: “Women’s football has been going from strength to strength and here in Inverness it’s the same. You go to the community events here and the number of girls playing football is fantastic to see. “It’s something we as a football club are looking at, resurrecting an Inverness Ladies football team which is attached to the club and it is something we should do as the amount of talent in these young girls is fabulous. “The women’s game in general domestically is getting stronger and our top players are playing in England and abroad. Robertson is thrilled by the achievement of women’s head coach Shelley Kerr and her side in qualifying for next summer’s finals in France and has experienced first-hand the improvement which is taking place in the women’s game. The Caley Jags boss said: “It is fantastic that the women’s team has qualified. I felt they had a missed opportunity against Switzerland after scoring two early goals. “They gave everything they had but it looked like it was going to be another glorious Scottish football failure with the team coming up just short so to go to Albania and get the result they needed is fantastic for Shelley Kerr and the girls. “This is the first Scottish team since France in 1998 to reach the World Cup and that’s how it should be looked at. Women’s football is a serious game now and the national team has done the country proud and should be rightly lauded for their achievement. “All they have lacked is the physicality and the know-how but look at the women now and they have the know-how. “They don’t have the physical attributes to smash the ball, they have to play their way through the lines and it’s working at the national team, the 19s and the 17s.